Wonderful little Maggie went to her forever home Saturday. 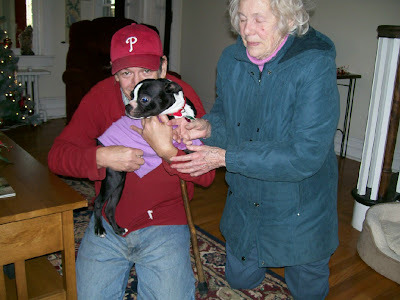 Her new family came to pick her up and they were greated with many many kisses. 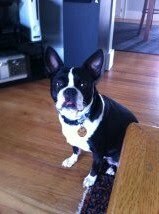 They have a 3 yr old Boston at home so once Maggie gets settled in I'm sure the play will begin. She will also have a very large yard to play in. Picture 1 is Maggie in her new traveling shirt waiting. 2. Walter and his mother getting acquainted with Maggie. 3. 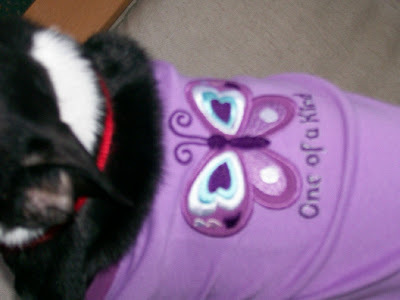 Maggie's traveling shirt says " One of a Kind". Bennie and I miss her. She was wonderful coming home not afraid at all. 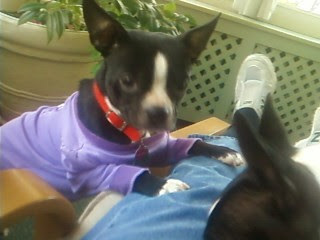 But she is timid and Roxy was so excited we kept them seperated. Last night Maggie watched TV with mom on her bed and slept in in her little security blanket cage overnight. Roxy has her own room. Today we had a few brief moments of letting the two together, and there was no fighting. Each day we will allow them to get aquainted. Dawn did a wonderful job to save this special dog. I may have to attend her backside every day until rainbow bridge but i will do it with a smile. This girl has a beautiful mind. And the sweetest personality. Dawn kept her chin up but it is hard to give these dogs up. Perhaps you could have another rescue sent to her soon. Everyone i met talked highly of the women who run this rescue and i can see why. Tomorrow Maggie will meet Dr. Koenig and maybe we will learn more about her. She just poked her head in my room. I expected a little frightened but she is not one bit. She came running for food with a little jump in her step. She already seems to be a happy dog. When i gently speak to her she listens intently like Poppy used to. So uncommon in a dog this young. This is going to work out fine. Feels like our family is complete once again. 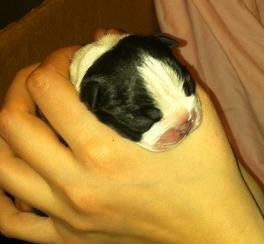 Mandy and her puppies are doing great. They are growing so fast! 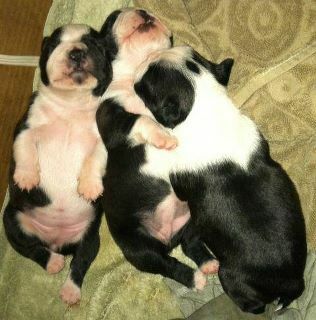 And their eyes started opening yesterday which is so exciting for us! Mandy is doing much better as well, with almost no signs of her mastitis. Thank you so much for all your support getting us to where we are now - we're excited for the next steps with them. We are absolutely in love with Mandy and the three whom we are calling Betty, Harvey, and Noodle (a nickname that just seemed to stick!). Noodle's eyes are open, Betty's are coming, and Harvey is still working on it but I see they are beginning to come. Mandy is 2 years old from what we know, and we absolutely adore her. We're adopting her and one of her pups, and the other two pups are spoken for as well. I've never seen news travel so fast as when puppies are involved! As for now, we are relishing every moment we have with them. Mandy is a complete sweetheart in spite of a very tough life. 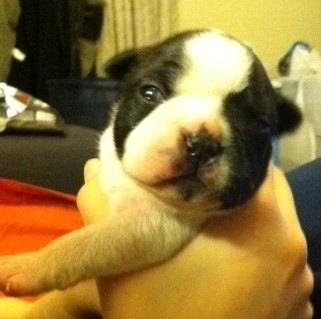 This is her last litter of many after life in a puppy mill (she just had a litter in July poor little girl). We just adopted out our foster Ace. How bittersweet! Ace is normally a little skittish around new people, but he seemed to love his new family. He was a little afraid of his new big (and I mean big) brother Oreo, but I think they will be great for each other. He was a little afraid to leave with them, but when we got outside he walked away like he had known them forever. 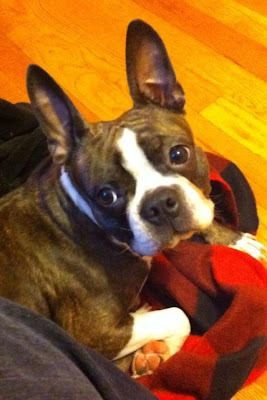 I never forget him walking away with his little floppy ears. We'll miss you Ace!! 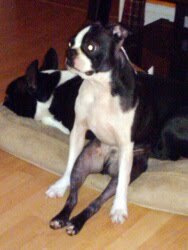 Many thanks to Joe and the Boston Terrier Rescue of East Tennessee who have offered to donate sweaters to keep Teddy warm this winter. Teddy has had it rough. 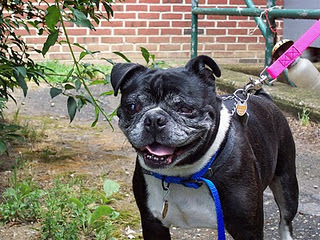 He was callously dumped in an overcrowded Philadelphia kill shelter when he was going blind and in a great deal of pain from untreated glaucoma. The family who left Teddy at the shelter said they no longer wanted him because he was now too old. NEBTR was contacted and scrambled to make room for Teddy in a foster home so his life would be spared. He has been with NEBTR now for 1.5 years. 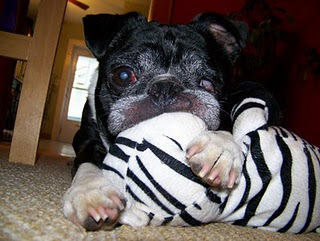 Teddy lost his sight but his eyes are now stable and do not cause him discomfort. He has been thoroughly evaluated by ophthalmologists at Cornell. He just needs some moisturizing drops once or twice a day. Other than Teddys damaged eyes, he is quite healthy. He is active for an older guy and likes to be on the move. He likes his people, but is not a big cuddler. He loves to be petted and scratched though and he likes to play. His favorite toys are his Snoopy and Woodstock stuffed toys. He plays with them during the day and sleeps with them at night. 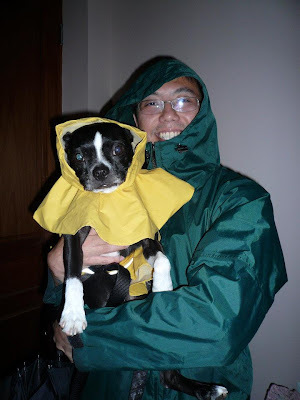 Thanks to Joe for helping to keep Teddy warm and cozy! Meet new foster Wheezy!!! He is a 2 yr old male, good with dogs and people. He came to NEBTR because his family moved and couldnt take him with. Keep a lookout for updates on this handsome boy! 1. I will not play tug-of-war with Dad's underwear when he's on the toilet. 3. I do not need to suddenly stand straight up when I'm lying under the coffee table. 4. I will not roll my toys behind the fridge. 5. I must shake the rainwater out of my fur BEFORE entering the house. 6. I will not eat the cats' food... before OR after they eat it. 8. I will not throw up in the car. 9. I will not roll on dead seagulls, fish, crabs, raccoons, skunks etc. 10. I will not lick my human's face after eating animal poop. 11. "Kitty box crunchies" are not food. 12. I will not eat any more socks and then re-deposit them in the backyard after processing. 13. The diaper pail is not a cookie jar. 14. I will not wake Mommy up by sticking my cold, wet nose up her bottom end. 15. I will not chew my human's toothbrush and not tell them. 18. We do not have a doorbell. 19. 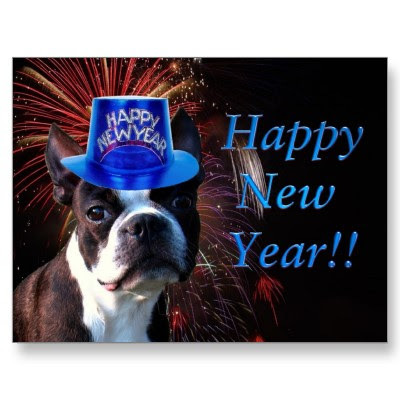 I will not bark each time I hear one on TV. 20. I will not steal my Mom's underwear and dance all over the back yard with it. 21. The sofa is not a face towel. Neither are Mom & Dad's laps. 22. My head does not belong in the refrigerator. 23. I will not bite the officer's hand when he reaches in for Mom's driver's license and car registration. This is Lucy. Lisa Vaughan was her foster mom. Lucy now lives in upstate NY, and has since May of 2009. 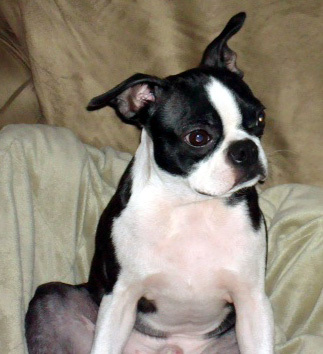 Lucy enjoys playing with her sister Roxy, biting at Roxy's legs, and racing around the house. She also enjoys lounging around. Lucy says thank you to NEBTR for her rescue and for her wonderful home with Mark Braunitzer.